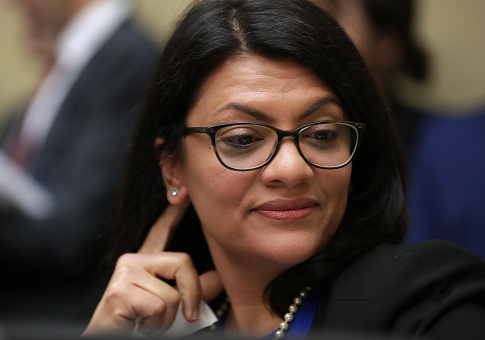 Rep. Rashida Tlaib (D., Mich.) accused Democratic leadership Saturday of having "silenced" Muslim lawmakers and only using them for "photos" on Saturday. In a tweet Saturday morning, Tlaib, who is Muslim, went on the offensive against her party's congressional leadership. She claimed they had failed to properly defend Rep. Ilhan Omar (D., Minn.), another Muslim, from "attacks." "They put us in photos when they want to show our party is diverse," she said. "However, when we ask to be at the table, or speak up about issues that impact who we are, what we fight for & why we ran in the first place, we are ignored." Tlaib made her remarks in a retweet about Omar, which condemned "[t]he attacks on [Omar]" by Republicans and the "subsequent lack of support from Democratic leadership. Omar came under fire for calling the 9/11 terror attacks in 2001 as "something" done by "some people" in a speech to the Council on American Islamic Relations. Rep. Dan Crenshaw (R., Tex.) called Omar's comments "unbelievable." On Wednesday, Rep. Max Rose (D., N.Y.) was the first Democrat to criticize publicly Omar's comments, saying that "words matter." On Friday, Rep. Ben Ray Lujan (D., N.M.), the assistant Speaker of the House, called Omar's 9/11 comments "extremely hurtful." Also Friday, Democratic National Committee chairman Tom Perez declined to comment, calling Omar's comments and the subsequent reaction a "distraction." That same day, Tlaib described herself as "furious" at Omar's treatment over her comments. In her tweet, Tlaib criticizes Democratic leadership for using the Muslim representatives for "photos." In August 2018, Tlaib appeared in a Politico Magazine story as "the left's way forward." After her election, Omar appeared alongside Pelosi in a Rolling Stone photo shoot. Shortly thereafter, Omar made a series of anti-Semitic comments for which Rolling Stone had to issue an editor's note and additional information. Pelosi was forced to issue a condemnation. In comments to Rolling Stone during the scandal, Omar said: "Speaker Pelosi has been a mentor throughout this whole process and I look forward to working with her in furthering the people’s agenda."